This week was a pairs betterball event with 26 players competing. Starting off cold (although Dave did have his shorts on) it soon turned into a beautiful day for golf. However due to the recent rains any player venturing onto the surrounding sandy areas found themselves a few inches taller! The rains did not fill the lakes though. In a turn up for the books it was the norwegian duo of Kristen Quamme and Sissel Hagen who triumphed with 46 points, leaving the partnership of their husbands (Jan and Borre) trailing in their wake. 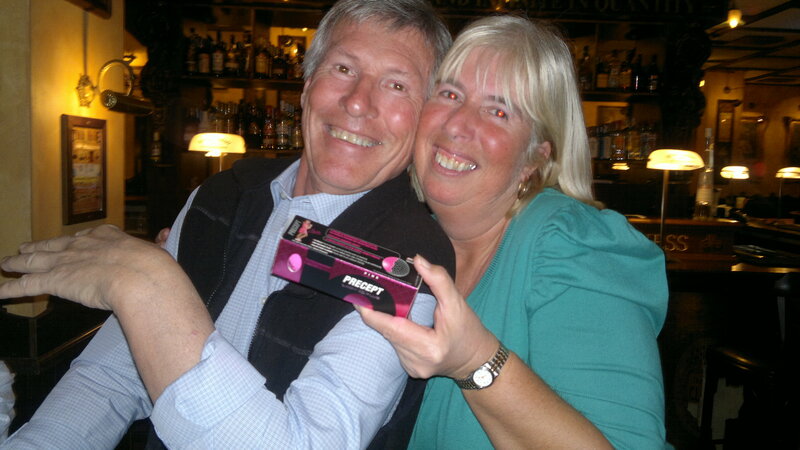 In second place with 45 points was another lady, Lesley Parsons in partnership with her husband Mick. Don’t forget to get your entry in for next week’s anniversary trophy if you are at Condado. Also you need to book if you are coming to the buffet presentation at Scottees at night. Dave LLoyd has donated several prizes and also got a promise of golf vouchers with buggy from Polaris World! On top of that he managed to get 2 bottles of wine from the Clover. I have a promise from Olagolf for some golf vouchers and a prize from the shop. The good news is that Donald has been seen alive and well. He has upgraded to La Isla but I want to know how he got past security? I hope to post the summer fixture list next week so you can all book your flights early to fit in with your favourite tournament. I shall make a separate post tomorrow about our plans to formalise our society. We shall discuss the proposal at wednesday’s meeting although it will not be an AGM as we are still a casual organisation. The society has grown in the last year beyond all expectations and needs to be on a more formal footing as myself and Graham now need more assistance. I shall post a notice of intent which basically will formalise the operation of the society from March 1st 2011. Until then entry fees will revert to 2 euros a competition. Probably the only change that will be obvious to you all is the introduction of an annual fee of 5 euros membership which allows players to play with the society and benefit from society rates. At present this is 10 euros less than the residents rate so immediately you get your money back. Also the present entry of 3 euros will revert to 2 euros saving a euro every time you play. It will be a non profit making organisation with all funds being used for society members benefits. A more detailed article of the constitution will be displayed in my next post. Surpisingly considering the time of year we had a great entry of 34 players, which included 6 ladies which meant they could play for their own prize. It was a cold windy day – it must have been cold because it was the 1st time I’ve seen Dave Lloyd on the course without shorts (he did have trousers on though!). The green were fast, which the head greenkeeper did comment on a couple of days ago. They were even too fast for him so he said he would slow them down by raising the cutters. Well done to Ken who has struggled off maximum handicap for some time but finally has shown a consistent improvement and was in the prizes for the 1st time. Congratulations also to John Pitman. Whilst most of us struggle to get out of a bunker John managed to hit his ball and Kevin Smiths onto the green at the 12th with one shot! I have added a photo from last weeks competition – this was the most improved Norwegian golfer (J.E.B.) who received a sleeve of pink balls. Lesley Parsons was very envious! We are a bit worried about Donald the duck who has not been seen since tuesday and the 10th fairway was covered in white feathers. I have posted a posthumous photo of him with Phil and Kevin on the 11th so if anyone has seen this duck please call duckline on 22 22 22 . Graham has spent the week in Benidorm wishing he was here but he will be playing next Friday in the pairs betterball competition. It looks like a firm booking at Scotties for the anniversary trophy presentation and buffet. Starting at 7pm the buffet is priced at 8.50e and David Ingham will provide transport there and back if required at 5e per person. We are looking for a minimum of 30 people so if you wish to go please email me at barrybarker90@yahoo.co.uk. They are cancelling fish & chip night to accomodate us. Also anyone who wishes to play in our 1st anniversary comp let me know. The format will be a 2 ball pairs scramble with partners drawn on the 1st tee. For the last year we have classed anyone who has played as a member and put them on the handicap list. We have been discussing making the society more formal with an annual subscription of only 5 euros. This doesn’t sound much but considering we had 450 different players with us last year it will enable us to cover expenses and buy trophies, prizes etc. All funds will be used for the benefit of members in some way. To play with the society you must be a member but considering the residents price is 10 euros more than the society you will save 5 euros immediately on playing your 1st game. Also the entry fee of 3 euros will reduce back to 2 euros so a saving of 1 euro will apply on each game played. All this will be paid back out in prizes and occasionally prizes will be supplemented from our fund. All this is still to be finalised. To win a major trophy there will be some kind of qualification based on how many times you have played with us – this could be anything from 1 round to 3 rounds of formal society stablefords. Again this is to be discussed but expect firm details very shortly. This week it was a 3 person team event which attracted an entry of 7 teams. The winning team with a score of 83 points was Dave Lloyd, Mick Parsons and David Dale. In 2nd place were Graham White, Tony Buckton and Gert Willumsen with 77 points. Grahams eagle on the 9th was not enough to put pressure on the winners. We did have some 1st time players as usual, but what was different was that Roderik Bogard from Holland introduced us to his local custom of buying everyone a drink on his 1st outing with a new club! Don’t forget our big day on the 4th of February when it is the anniversary cup. An annual prize with replicas for the winners and prizes for the longest drive, nearest the pin and worst score! It will be between 10 – 12 euros each for food, transport and entertainment and it will be a good night out. Hopefully Cath will organise more social events in the next few months. The course is in good condition but the water levels in the lakes are quite low. The area around the new water meter has now been levelled and hopefully plants will be replaced. The twilight rate has been reintroduced. 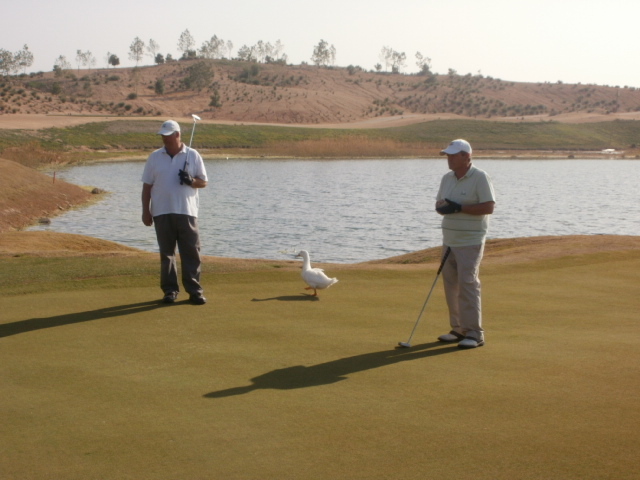 From 14.30 residents can play for 35 euros or 45 euros for non residents. It has been beautiful weather at Condado this month so hopefully it will continue until next Friday when there is an individual stableford. The new year started with much better weather and 23 players took part in the blind pairs competition. Playing individual stableford the cards were drawn into pairs afterwards in the bar. A bit of a lottery but a change of format. Work on the course is continuing but until the weather warms up in March/ April growth of the grass in the rough will be limited. The water meter work in front of penthouse 10 is complete although there is still some final tidying up to do. Lets see if the plants are replaced. Next week is a 3 person team event with the best 2 scores at each hole to count. Monday, although not an official event has already attracted 18 entries and is proving to be popular. 20 Spaces were pre booked and 20 Players battled it out in the brilliant sunshine. Each tee group playing their own competition. After Fridays weather and previous weeks, it was nice to play again in shirt sleeves. Thank you to all who have supported the Monday Golf events over the past 6 weeks. Next week Dave Lloyd will be back in the chair arranging the Monday events.